A Lot Colder Than Hell - You Wanna Buy A Manned Lunar Base? The recent recession has been devastating. One of the scary by-products is that now the states are generating less tax revenue. This means that to balance the budget, they have to cut programs. Politicians hate doing this because it makes them unpopular with voters, even though it's not their fault. They're just trying to be fiscally responsible. Here in Texas it's already happening - cuts in vital programs, even though Texas wasn't as badly affected by the recession as many other states were. The lesson for all of us - we need to care what the government decides to spend our money on. There's NOT an unlimited supply of money out there. If they borrow, sooner or later, accumulating debt will cause a government to go bankrupt. It can happen. Look at Greece. The research and development of new technology to make space exploration happen is EXPENSIVE. If you tell the government you want this, they'll have to cut expenditures somewhere else. This is why I believe when NASA talks in excited tones about a MANNED LUNAR BASE or a MANNED MISSION TO MARS, you should do more than think romantic thoughts about OUR DESTINY. You should appreciate what's really involved and whether the payoff is worth it. For example, a base on the moon needs to simulate habitable conditions. This wasn't such a big deal when the lunar missions of the 70s planned for people to be on the surface for only a few days in optimum conditions. A manned lunar base wouldn't be like that. There is no place on the moon that has optimum conditions all the time. It takes 28 days for the moon to revolve around the Earth. During that time, the side of the moon we see is facing the sun only half the time. The rest of the time it's dark. This is also true of the "other" side of the moon, the side we never see. So what? Well, here's so what. The only heat the moon ever gets is from exposure to the sun. There's no atmosphere on the surface of the moon. 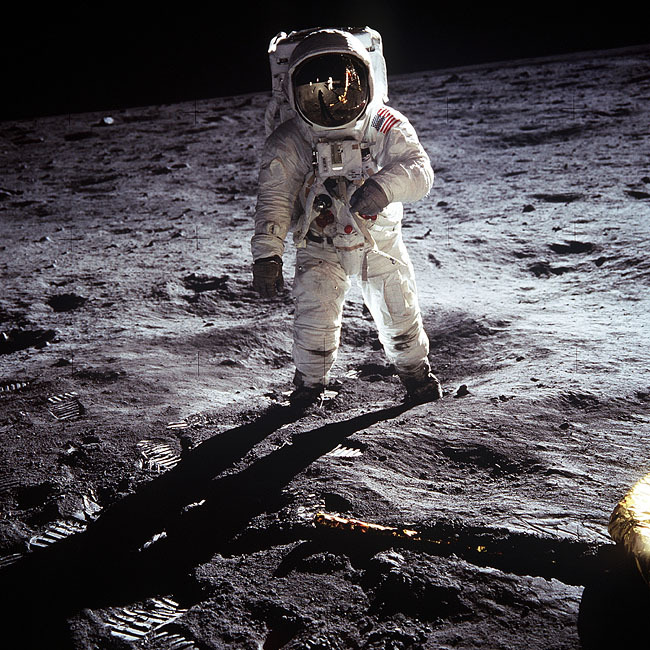 When you're standing on the moon it's like a "space walk." An object exposed to the sun may heat up to over 200 F. An object in shade may cool down to -300 F. During a dark phase, the base camp will have unrelieved cold temperatures of from -300 F to - 400 F, for 2 or 3 weeks, several times a year. With no exposure to sunlight and when temperatures drop that much, how will the crew generate enough heat to keep from freezing to death? Also, in extreme cold, things stop working right. Lubricants freeze solid, causing technology to fail. This happened to the robot surveyors on Mars, where conditions are not as severe as on the moon, because of its atmosphere. Here in Texas, when the temperature fell below freezing day and night for four days, we worried that our septic system would back up. Why? Because it's an aerobic system that creates "gray water" and sprays it on the lawn through an irrigation system. But if the sprayers freeze, the water won't release, and it will back up. That would be nasty. We tend to take this stuff for granted, but reality is an interesting teacher. There's no negotiating with physics. "Nature" just does what it does. So we cut back on water usage and after four days, everything thawed out. Whew! But on the surface of the moon, weren't not talking 25 F. On the moon, we're talking about temperatures 200 degrees colder than the coldest temperature ever recorded anywhere on earth. Right now NASA has no solution. What they need is MONEY - lots of it - to figure out how to deal with this problem. And a bunch of others. You want to give them the money? Is it worth it to you? You see a wonderful payoff for a manned lunar base? I'm asking because you're the guy who funds it, remember? You're the poor slob who sends part of your paycheck every month to the government so they can do this stuff. Or would you rather they spend the money on something else? Like research to preserve our soil, our water, our air? Better education for our kids? Improvements to highways? Alternative sources of energy? Whatever matters to you. You're the guy with the money. It's your call. You're right, Denny. It's an important reminder. We are the guys with the dough.